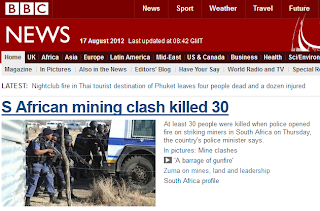 This is the news plastered on major news outlets today: "S African mining clash killed 30". It's a real shame and a damn sad day for the Rainbow Nation. We have yet to see any meaningful comments from the Presidency and I hope that comes quickly... This is not 1960 and we really don't need another Sharpeville. Don't the police have other ways to handle situations like this? Water cannons come to mind... Apart from some bruising and slipping, it doesn't seem all that harmful compared to rifles and hand-held automatic weapons. Update (17/08/2012 13:00): The Presidency just announced South African President Zuma will depart the Southern African Development Community (SADC) meeting early to visit Rustenburg, site of the deadly police shootings. "Zuma is to cut short his attendance of the 32nd SADC Summit in Maputo, Mozambique, in order to visit Rustenburg this afternoon," reads the statement. Update (17/08/2012 15:40): President Jacob Zuma said he is "shocked and dismayed at this senseless violence."